Traditionally, electrical network protection schemes rely on hardwired connections between Intelligent Electronic Devices (IEDs). The problem with that approach is it makes it difficult to correct, modify, or update the protection logic. Generic Object-Oriented Substation Events (GOOSE) messaging, on the other hand, eliminates the need for such hardwiring and simplifies the work of engineers, architects, and network designers. Unit and overall space savings: Because the number of opto inputs and relay outputs can be reduced, so can the IED size. Even the extra space required for Ethernet switches is more than made up for by significantly smaller IEDs. Schematic layout time and labor savings: The drawings that define communication wiring are replaced by an IEC 61850 configuration description file that can be engineered with software tolos. Less labor-intensive wiring: The dozens or hundreds of cables required to connect relay outputs to opto inputs are replaced by a few fiber optic or Ethernet cables. Factory Acceptance Test (FAT) time and labor savings: Unlike hardwired communication, where all wiring must be carefully checked, testing electrical network protection schemes employing GOOSE messaging only requires that IEDs are connected to an Ethernet network. If some relays are not present, they can be simulated. Site commissioning time and labor savings: Instead of re-running all communication wire testing on site, IEDs not receiving expected GOOSE messages simply show an alarm. Enhanced protection and reliability via monitoring: In hardwired communication, if one relay to an opto input is cut, it’s only detected when the protection scheme fails to operate upon fault, which is too late. With GOOSE messages, which are published periodically, faulty communication links raise an alarm and maintenance personnel can fix it quickly. Enhanced personnel safety and shorter outages: With the traditional approach, each wire from one relay output to an opto input must be tested, and these tests pose a safety risk for the personnel. Further, the risk of protection scheme malfunction increases, as does the length of potential outages. GOOSE schemes, on the other hand, are self-monitored and therefore maintenance-free. Easier communication link repair: In contrast to fixing damaged communication wires, GOOSE communication links are far more easily and more quickly repaired, and outages during the repair process are not necessary. This increases personnel safety. Simplified engineering updates: Adding equipment used to require additional wiring. With the GOOSE messaging approach, only settings files need to be modified when an electrical network protection scheme is updated. 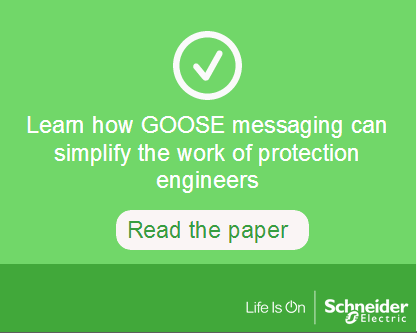 For more details, read my free white paper: Impact of GOOSE Messages on IED Protection Schemes.